Happy Spring!! I don’t know about you, but Spring is most definitely my favorite season of the year. Depending on where you live, the weather has warmed up (we hit the 90s last week – too warm!) and when the weather is nice like it has been I just crave good, light, fresh food. No offense to winter comfort food, but I am so done with all that. Bring on the crunchy veggies, fresh fruit, all things grilled and my current favorite obsession – grain salads! 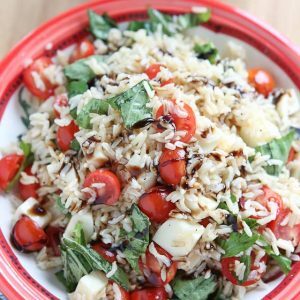 This Caprese Rice Salad screams fresh, warm weather food and was enjoyed along side our favorite grilled chicken. I know tomatoes are technically a summer food, but here in Florida they are pretty much available all the time. Especially the smaller varieties like cherry tomatoes, which happen to be one of my favorites. They are sweet and bite sized and are perfect for salads like this one. Cook brown rice according to directions. Fluff with a fork and transfer to a glass bowl. Let chill in the refrigerator for 1 hour or more. You can make the rice a day ahead. 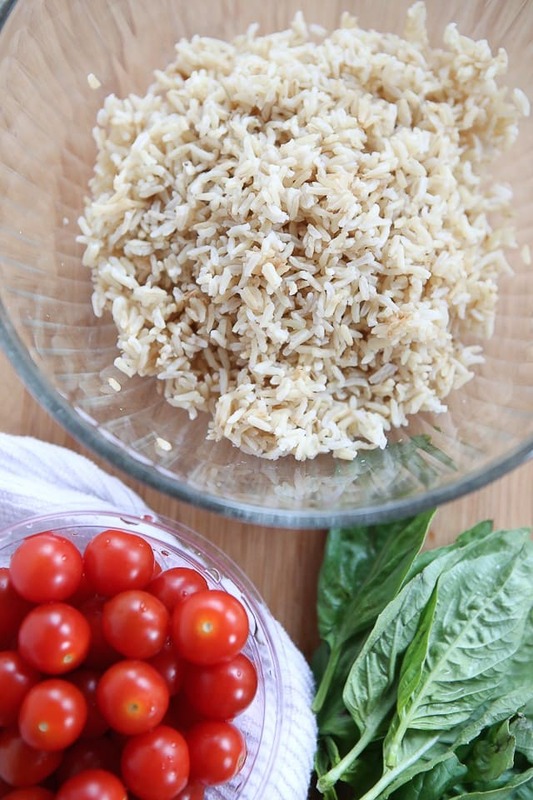 When rice is completely chilled, add tomatoes, freshly torn basil and mozzarella to bowl of rice. Season well with salt and pepper and drizzle with 2 tablespoons olive oil. Gently toss to combine. Transfer to serving bowl and drizzle with desired amount of balsamic glaze. Serve chilled or at room temperature. 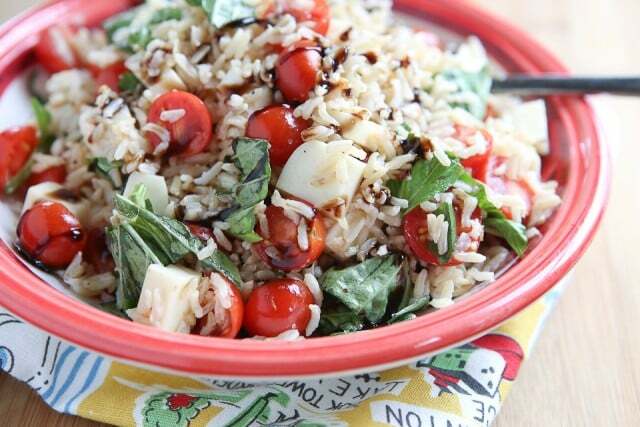 For more rice recipes follow USA Rice on Pinterest, Instagram and Facebook. Love dishes like this that can be served warm or cold. Perfect for taking to a get together. AND I am prety obsessed with everything caprese! I love this…what a great idea, Aggie!! The colors…so vibrant! I have to make this soon! Looks totally delightful! 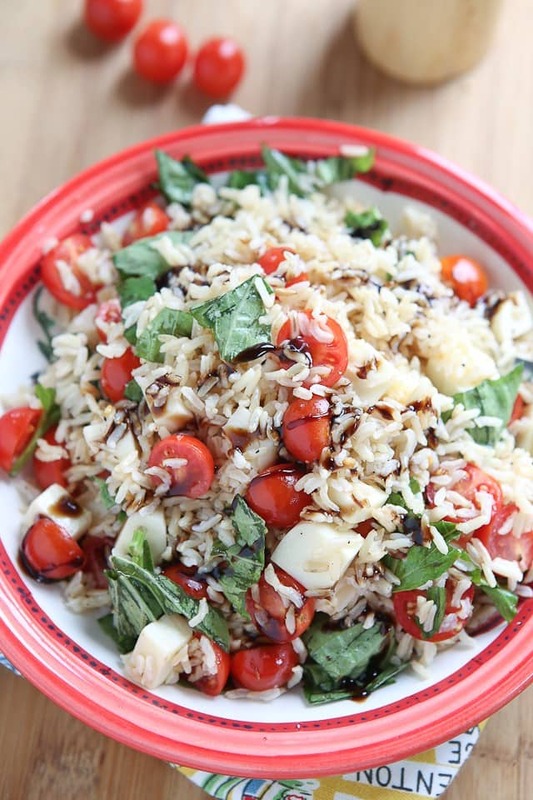 I love the caprese mix and never though to add rice! This sounds and looks OMG. I hear ya! I am like you itch to make recipes with food that is not in season elsewhere and make excuses about it on the blog haha. Who cares. Brown rice we eat a lot! This looks so good! My tomato- and rice-loving little guy would devour the bowl! My favorite flavors!!! Gorgeous salad Aggie!!! This look beyond delicious. I could eat this every single day. I love the ingredients in this!! Wow, you’ve seen temps in the 90’s already?! We just had 2″ of snow yesterday. 🙁 Luckily, it’s mostly gone already. This looks like a wonderful salad. 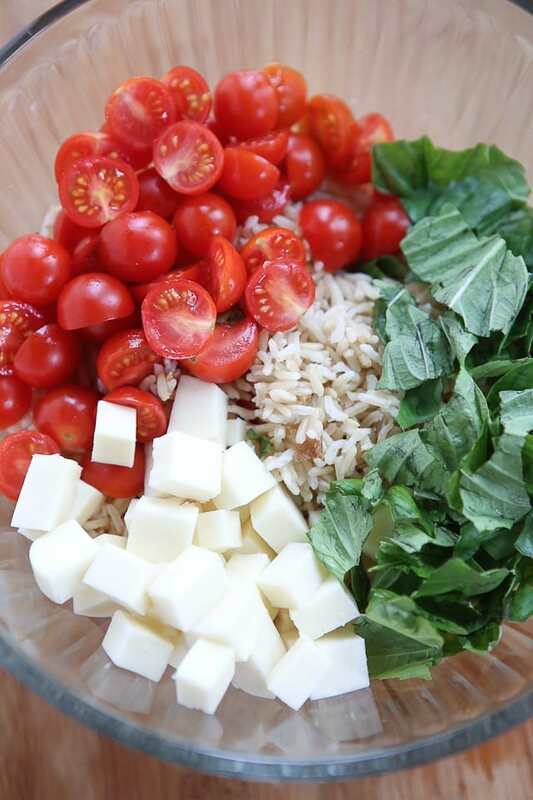 Our youngest daughter absolutely loves rice and caprese salads. I think this salad needs to happen just for her! This was my favourite meal back in my high school days.